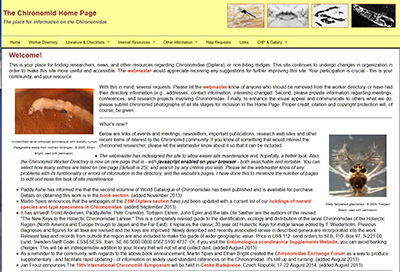 The Chironomid WWW pages were started by Luc Int Panis in February 1995 at the University of Antwerp (UIA). The primary goal was to facilitate the exchange of information between scientists by one of two different ways: (1) offering WWW pages to provide a means for rapid communication about chironomid research; and (2) providing a source for storing large amounts of information of general interest and which could be frequently and rapidly updated. This was a means to take advantage of the general availability, speed, data storage capacity and multi-media nature of the web. Therefore these pages are complementary to the CHIRONOMUS newsletter. At first success was limited. Few people knew of the existence of this site and only a limited number of files were available. The inclusion of colour photographs and messages on mail-lists increased awareness, and with other sites cross-linking the Home Page, the number of visits went up to about 250 each month. (Remember, this was in the mid-1990s, when the general public's web activity was still limited, especially outside of the USA). Gradually more colleagues provided files to put online. [Given the size and large number of changes that we receive it is perhaps the best example of the sort of files that should make up these pages]. The introduction of the chironomid worker directory proved to be very succesful. Because Luc Int Panis left UIA in September 1995, there seemed to be no future for this site in Antwerp. The files were transferred to Ian Walker at Okanagan University College in February 1997. He maintained the site from 1997 through to January 2004, when Ethan Bright at the University of Michigan assumed responsibility for its design and maintenance. The Chironomid Home Page was shortly thereafter redesigned to improve its user functionality and aesthetics. Further changes were made in 2013 including a new searchable worker directory as well as improvements in website maintenance and functionality. After ten years of hosting the website, the server at the University of Michigan's Insect Division was to be decommissioned. A new hosting server and a new address was needed, and the site is now home at www.chironomidae.net. This site will now be maintained through volunteering donations, but the new site permits opportunities for a new vision and useful resources. The website is now compatible with multiple platforms, including tablets and smartphones. For the future we would like to encourage people to not only submit files and announcements of general interest to people studying chironomids, but to actively participate in developing this site. As in the past, authors are encouraged to submite files that are too large or expensive (e.g., because of colour photographs) to be printed as well as short communications intended for quick and widely available dispersal, or information meant to be available so that they can be searched for keywords or names. Please send the webmaster files intended to be included in this site in either a text or html format. Of course the authors of the files remain responsible for the contents of the files.